I am trying to run an Ubuntu Server 16.04 guest in an Ubuntu 15.10 host with Host Only networking in VirtualBox. I am aware there are few questions with similar problems, their configuration isn't quite the same as mine and I'm still stuck after reading them. The guest can ping and fetch data from both the host and external websites. The host cannot ping the guest or connect to any web service running on the guest. I am following these instructions with some details changed. One Host-Only network created, vboxnet0 with address 192.168.100.0 and network mask 255.255.255.0. Guest has NAT for adapter 1 (default setting) and vboxnet0 as adapter 2. The interface names are not eth0 etc, apparently this is due to kernel evolution and it should be fine. This seems to show the correct inet addr for enp0s8 (which is the Host Only adapter), and enp0s3 is NAT which appears to be working. I don't know how to interpret this exactly, but for some reason it lists 192.168.100.0 instead of 192.168.100.1, which is what ifconfig and /etc/network/interfaces have. 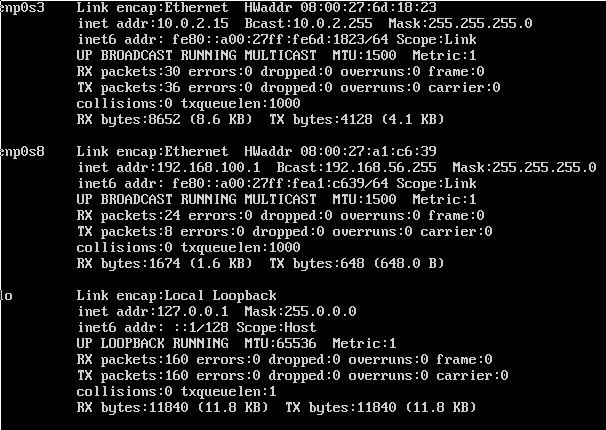 PING 192.168.100.1 (192.168.100.1) 56(84) bytes of data. It started working when I changed vboxnet0 to have an IP address of 192.168.100.254 instead of 192.168.100.0. Not the answer you're looking for? Browse other questions tagged linux networking ubuntu virtualbox or ask your own question.